Lateral Extensometer for Concrete Testing - This is for determining the lateral extension of 15cm dia x 30 cm high cement concrete cylinders while testing them under compression. The unit consists of two movable frames pivoted at one end. The extensometer is fixed to the specimen with the help of tightening screws. The lateral extension is indicated on a dial gauge of 0.002mm x 5mm is mounted on the upper ring and the tip of the dial gauge rests on an anvil. The zero on the dial gauge can be set by adjusting the anvil screw. 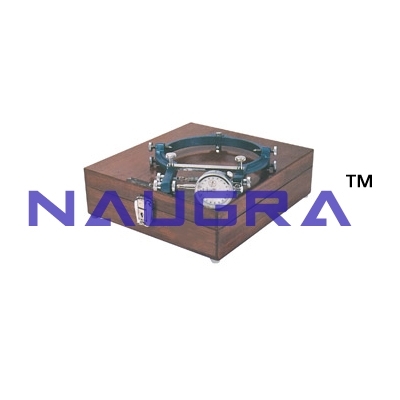 Supplied in a wooden carrying case..
We are leading manufacturers, suppliers & exporters of Lateral Extensometer For Testing Lab for Concrete Testing Lab. Contact us to get high quality designed Lateral Extensometer For Testing Lab for Concrete Testing Lab for schools, colleges, universities, research labs, laboratories and various industries. We accept bulk orders for government tenders in all countries around the globe.